Being one of the reckoned enterprises in the market, we are highly affianced in offering an optimal class gamut of Bike Stylish Seat Cover to our patrons. Being a reputed company in the industry, this is our responsibility to offer standard quality Bike Seat Cover. With prosperous industry practice, we are known to offerScooter Seat Cover. It is made by experts using the advanced technology. We are Looking for a Bulk Quantity. This high-quality Platina Bike Seat Cover provides breathable airflow which doesn't let the seat heat up under the sun. 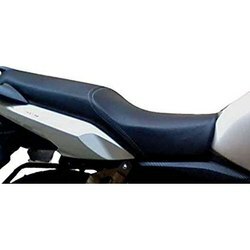 RMCO is a renowned manufacturer / supplier / wholeseller of superior quality two wheeler accessories. Being a consistent firm, we are presenting a comprehensive range of Leather Two Wheeler Seat Cover. Offered product is tremendously praised by customers for their topmost features. Our expert’s team inspects this product on diverse industry parameters. In addition, we can modify this product as per the demands of our customers.